ARTNATURALS ALL NATURAL ARGAN OIL SHAMPOO, 100% SATISFACTION GUARANTEED: Your satisfaction is what drives us to provide the highest quality all natural and organic health and beauty products on the market. If at any time you are not completely satisfied with your purchase feel free to return it to us for a full and prompt refund. At ArtNaturals we are committed to the fair and honest treatment of our global growers and partners. This is why our argan oil is certified fair trade. This level of dignity and respect stretches beyond our workforce to include all of nature. We stand committed to the production of paraben free and cruelty free goods. Building relationships of trust with those committed to an organic and natural lifestyle is what we do, if at any time you have questions or ideas about how we can serve you better, we would love to hear from you. A NEW STANDARD IN ALL NATURAL HAIRCARE: ArtNaturals is constantly seeking to find ways to bring the healing and regenerative powers of nature to you. That is why we are so excited to introduce our new, All Natural Argan Oil Shampoo. 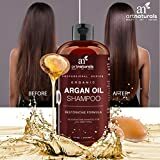 A new standard in moisturizing, dandruff reduction and split­end restoration, Argan Oil Shampoo is quickly proving to be a must have for anyone looking to bring moisture rich healing, reduce flaking and dry scalp, promote the growth of healthy strong hair, infuse hair with luster and shine, and begin to undo the damage caused by harsh chemical based shampoos and conditioners. The unwanted effects of coloring, blowdrying, sun damage, and hair treatments can take their toll on your hair, leaving it brittle and frail. 100% All Natural Moroccan Argan Oil is delicate and life giving for all types of hair, free of parabens, sulfates or harsh chemicals. Delicately balanced our shampoos are Infused with peach, avocado, Jojoba, and Almond oils to produce a hair care treatment which is as healthy for your your body as it is for your hair and scalp. 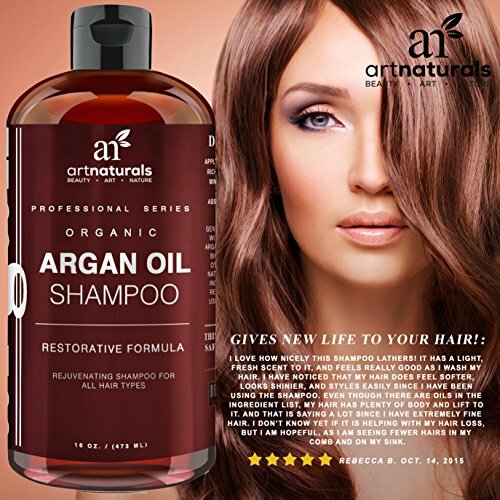 Working with the natural processes of hair growth irritant­free and hypoallergenic, our Argan Oil Shampoo comes to you with the assurance of ArtNaturals 100% Customer Satisfaction Guarantee. If at any time you are not satisfied with your results, simply return your shampoo to us for a full and prompt refund. 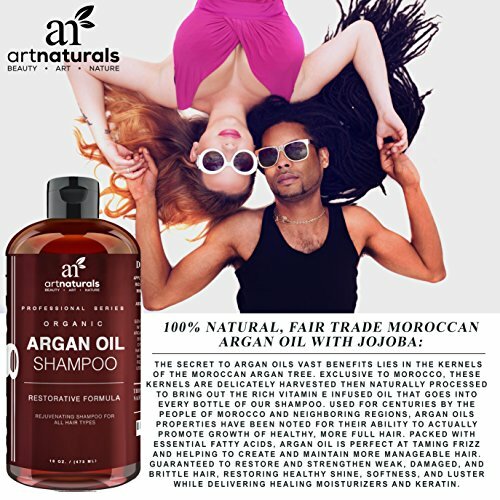 100% NATURAL, FAIR TRADE MOROCCAN ARGAN OIL WITH JOJOBA: The secret to Argan Oils vast benefits lies in the Kernels of the Moroccan Argan Tree. Exclusive to Morocco, these kernels are delicately harvested then naturally processed to bring out the rich Vitamin E infused oil that goes into every bottle of our shampoo. Used for centuries by the people of morocco and neighboring regions argan oils properties have been noted for their ability to actually promote growth of healthy, more full hair. Packed with essential fatty acids, Argan Oil is a perfect at taming frizz and helping to create and maintain more manageable hair. Guaranteed to restore and strengthen weak, damaged, and brittle hair, restoring healthy shine, softness, and luster while delivering healing moisturizers and keratin. Our Argan Oil shampoo also contains the deeply nourishing and further hydrating power of all natural JoJoba Oil. This gentle yet power oil is packed with vitamin E, B-COMPLEX, and replenishing moisture. When Jojoba oil is applied, it acts as a natural emollient soothing skin while unclogging hair follicles, promoting growth while hydrating and nourishing your hair. Chose to give your hair the same treatment you give your health, with ArtNaturals 100% Natural Argan Oil Shampoo, Satisfaction Guaranteed. ArtNaturals Presents: Artisanal Quality, Natural Beauty. Complete Moisturizing and Restoration for Damaged and Dry Hair. 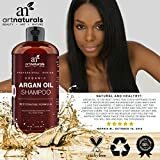 ArtNaturals Argan Oil Shampoo. ­ArtNaturals is proud to present 100% natural argan oil shampoo. Natural conditioning straight from the kernels of the Moroccan Argan Tree. 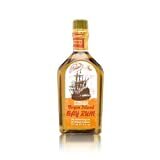 ­All Natural remedy for the moisturizing, dandruff reduction and split­end restoration of dry and damaged hair. 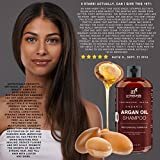 ­Moroccan Argan oil has proven to bring moisture rich healing, reduce flaking and dry scalp, promote the growth of healthy strong hair, and fill hair with luster and shine. ­Infused with Jojoba, Almond & Avocado Oils to give your hair additional all natural balance and healing. 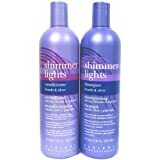 ­An ideal aid in restoring damaged hair caused by sun, harsh chemicals, or dyes. ­100% Satisfaction Guarantee. If at any time you are unsatisfied with your purchase, return it to us for a full and prompt refund. ­Fair Trade Certified. ­Hypoallergenic, Paraben Free, Sulfate Free, Cruelty Free. ­Made with Recycled Materials. ­16oz (473 ml) bottle. Art Naturals Artisanal Quality, Natural Beauty. 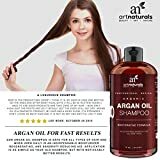 ARTNATURALS ALL NATURAL ARGAN OIL SHAMPOO, 100% SATISFACTION GUARANTEED: Your satisfaction is what drives us to provide the highest quality all natural and organic health and beauty products on the market. If at any time you aren’t completely satisfied with your purchase feel free to return it to us for a full and prompt refund. At ArtNaturals we are committed to the fair and honest remedy of our global growers and partners. This is why our argan oil is certified fair trade. This level of dignity and respect stretches beyond our workforce to include all of nature. We stand committed to the production of paraben free and cruelty free goods. Building relationships of accept as true with with those committed to an organic and natural lifestyle is what we do, if at any time you have questions or ideas about how we will serve you better, we would love to hear from you. A NEW STANDARD IN ALL NATURAL HAIRCARE: ArtNaturals is constantly seeking to find ways to bring the healing and regenerative powers of nature to you. That is why we are so excited to introduce our new, All Natural Argan Oil Shampoo. 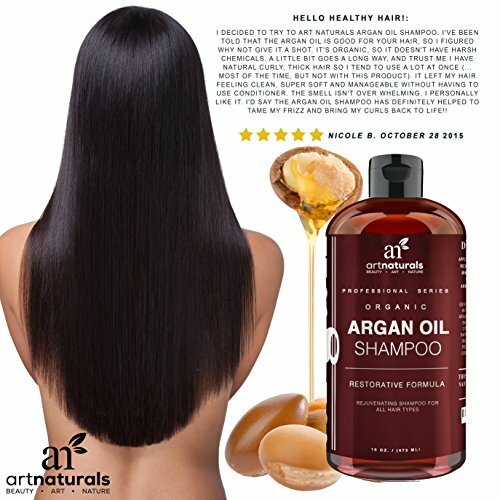 A new standard in moisturizing, dandruff reduction and split­end restoration, Argan Oil Shampoo is quickly proving to be a must have for anyone looking to bring moisture rich healing, reduce flaking and dry scalp, promote the growth of healthy strong hair, infuse hair with luster and shine, and begin to undo the damage caused by harsh chemical based shampoos and conditioners. The unwanted effects of coloring, blowdrying, sun damage, and hair treatments can take their toll on your hair, leaving it brittle and frail. 100% All Natural Moroccan Argan Oil is delicate and life giving for all types of hair, free of parabens, sulfates or harsh chemicals. Delicately balanced our shampoos are Infused with peach, avocado, Jojoba, and Almond oils to produce a hair care remedy which is as healthy for your your body as it is for your hair and scalp. 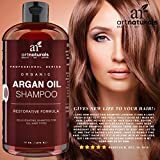 Working with the natural processes of hair growth irritant­free and hypoallergenic, our Argan Oil Shampoo comes to you with the assurance of ArtNaturals 100% Customer Satisfaction Guarantee. If at any time you aren’t satisfied with your results, simply return your shampoo to us for a full and prompt refund. 100% NATURAL, FAIR TRADE MOROCCAN ARGAN OIL WITH JOJOBA: The name of the game to Argan Oils vast benefits lies in the Kernels of the Moroccan Argan Tree. Exclusive to Morocco, these kernels are delicately harvested then naturally processed to bring out the rich Vitamin E infused oil that goes into every bottle of our shampoo. Used for centuries by the people of morocco and neighboring regions argan oils properties have been noted for their ability to if truth be told promote growth of healthy, more full hair. Packed with essential fatty acids, Argan Oil is a perfect at taming frizz and helping to create and maintain more manageable hair. Guaranteed to restore and support weak, damaged, and brittle hair, restoring healthy shine, softness, and luster at the same time as delivering healing moisturizers and keratin. Our Argan Oil shampoo also contains the deeply nourishing and further hydrating power of all natural JoJoba Oil. This gentle yet power oil is packed with vitamin E, B-COMPLEX, and replenishing moisture. When Jojoba oil is applied, it acts as a natural emollient soothing skin at the same time as unclogging hair follicles, promoting growth at the same time as hydrating and nourishing your hair. 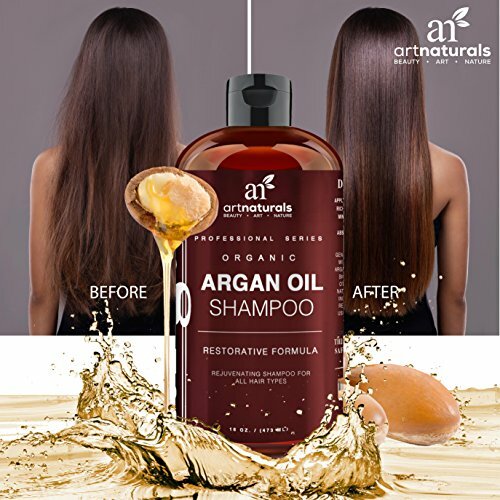 Chose to give your hair the same remedy you give your health, with ArtNaturals 100% Natural Argan Oil Shampoo, Satisfaction Guaranteed. GENTLE YET EFFECTIVE FOR ALL TYPES OF HAIR: Our Argan Oil Shampoo is safe for all types of hair and when used daily is an indispensable moisturizing, regenerating, and dandruff reducing aid. Application is a simple as your old shampoo, but with noticeably better results. Simply dispense a quarter size portion of Argan Oil Shampoo onto hands and massage deeply into scalp being sure to cover all hair and ends. Allow shampoo two to Three minutes to rest at the same time as the essential oils penetrate the scalp and begin to heal and regenerate hair. Rinse thoroughly and repeat daily or as needed. Argan Oil Shampoo will begin to show results within a week of your first application. For continuous added results try reinforcing with (ArtNaturals Argan Oil Hair Mask) another premier product in our all natural and organic line of hair care and beauty products. THE HIGHEST STANDARDS OF EXCELLENCE: At ArtNatural we are committed to the use of 100 percent all natural ingredients. We take into account that you place accept as true with in us, to provide you with safe, healthy and ethically conscious products. We take that accept as true with seriously and are committed to products that meet the highest standards of excellence. Our argan oil shampoo is certified fair trade and comes to you with the promise of ethical and fair practices for the skilled labor and global partners that proudly contribute to our products. All our products are all natural and meet the highest levels of consumer safety and transparency. Our ingredients are all the time clearly labeled and 100% thorough and truthful. Our love of beauty stretches beyond humanity and strives to see the wonder in all of nature. That is why our packaging is made with recycled materials and our ingredients vegan certified, paraben free and cruelty free.